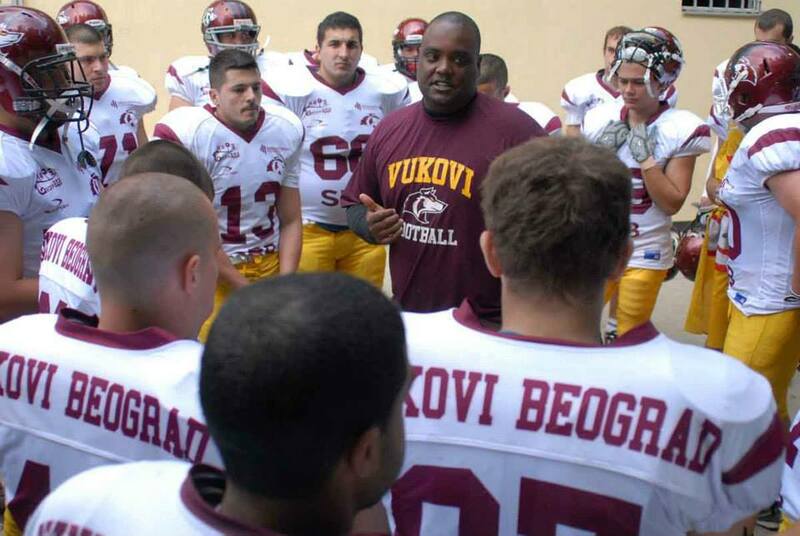 As "THE EVIL EMPIRE", Vukovi, wraps up both titles I'm confident in saying that this is the best football team to ever come through Serbia. I first want to say that I'm honored to have been around a bunch of great men who allowed me and my coaches to take them where they couldn't take themselves. These guys bought into the system and were coachable at every moment. I'm always preaching to my players that football is closest thing to life experience as your going to get. We are family. And with that, we are going to experience adversity and disappointment. But what's going to make us men and champions, is being able to face adversity and put it behind us. And like a tight knit family, we were going to handle adversity internally. We were not going to make excuses and we were not going to blame. We were not going to cry about the players we did not have or the players that we wished we had. Vukovi was going to fight as one and not as individuals. Every team experiences loss, its all about how you handle it. I truly believe that this was are greatest achievement. When i look back at this season, I believe we won these championships in the off season. We dedicated ourselves to conditioning, speed, and the weight room. We had a fast start and success came early, but we became complacent in the middle of the season. After the Novi Sad game, I decided to have a military style practice for 2 weeks. No footballs. Just military drills with weights, in the rain, on the field. Drills that only work through leadership and communication from the players. Not one player complained. We needed this to get back our mental toughness. We also did it, because I was sick of our team feeling sorry for ourselves. We had become too comfortable. We had come of a good win versus a very good Novi Sad team, but it was sloppy and Novi Sad had outplayed us. So it was important to the coaches and my team that we were not going to point fingers at anybody but ourselves. And a lot of players took the initiative to step up and say, "I need to play better." Novi Sad had done us a great favor. Because we went down to KG hungry for victory and we knew, after our 2 hell weeks, that we were going to be the better conditioned, and tougher team. We didn't care if the final score was 3-2, we just wanted to get our swagger back and get back to being tough! Now did it work? Yes! And after that win in the road, we became a better, closer team. We showed teams that Vukovi was going to fight shoulder to shoulder. We banded as brothers and we fought as brothers. And I'm proud of our team. I'm proud to be VUKOVI! All in all it this will be a great year to look back on. Our back up quarterback had a higher QB rating the Lance. I had 3 backups on defense get their first interception ever. I had 2 defenders score their first touchdowns. Our backup up running back, Slobodan, had a 37 yard scamper! As a team, we had 5 games where we scored on Offense, Defense, and special teams! Tony Washington had a 109 yard kickoff return, he returned 2 kicks against our rival for touchdowns and also had a 98 yard interception return in the championship game! And for all the haters, Tony Washington was the MVP.